Girl Kuripot Girl Kuripot: 50 Best-Ever Sunsilk Treats! The Hair Experts is at it again and they're at the Watsons HWB People's Choice Awards this year! Here's a chance to win and experience 1 of 50 Sunsilk treats! 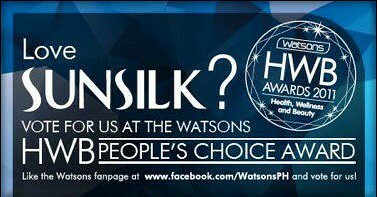 Just go to the Watsons HWB Awards 2011 Page and vote for Sunsilk in the Hair Category. 50 voters will win P1000 shopping spree from Watsons. 50 voters of Sunsilk will take home Sunsilk gift packs! The voting ends on July 10, 2011! 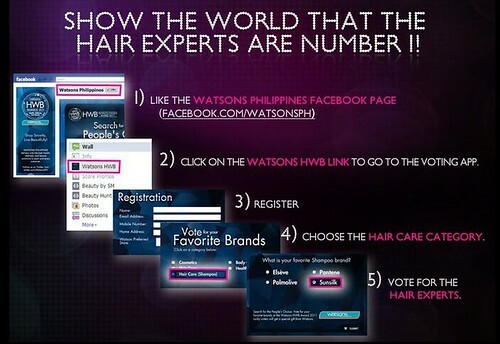 Click here to vote for the Hair Experts in the Watsons HWB People's Choice Awards 2011. Sunsilk is one of my favorite beauty products their TV commercial says it gave our hair soft and smooth and that is true. New Winner of BTAP Giveaway! Win a Trip to Malaysia! Win a Trip to Thailand Plus $3000 Cash! Win a Trip to Everest! Learn More and Win an iPod Touch with CIIT! Win Roundtrip Tickets to Hong Kong! Free Red Box Party for GK Readers! Win a Stay for 4 in Boracay! New Instant Rewards Allied Bank Freebies! Girl Kuripot Winners for the BTAP-APCEI Giveaway! Win a 3D2N Stay in Beijing! Win a Royal Carribean Cruise for 2! Win a Trip Around the World With Sofitel! Win Dinner, Overnight Stay or P15K Rustan's! Win a Stay for 2 to Misibis Bay! 115 Philippine Mountains, 115 Winners! Dream Big Pilipinas and Win P20K! Win a Trip to Singapore! Take a Shot to Experience Bhutan! Win a KLM Trip for 2 to Istanbul! Win a 4D3N Trip to Malaysia! Go Paperless, Fly to Singapore!